The Elephant in the Room...Appraisals! 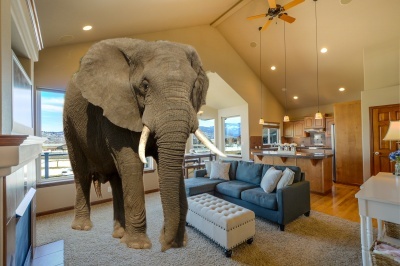 There is often an elephant in the room and many real estate agents and sellers attempt to ignore it. Can you imagine trying to ignore an elephant roaming around your home? It would not be something to pretend like it doesn't exist right? Well neither is ignoring appraisal issues. You have to acknowledge appraisals and have a plan to deal it. Your Palm Beach County real estate agent and Martin County real estate agent is on your side to make selling easier. Have a pre-list appraisal. We recommend a real estate appraiser that is realistically optimistic. What is the most that your home will appraise for in today's market? Selecting the right contract. Having a buyer that is cash or has a large down payment avoids the appraisal issues. Negotiating upfront that if there are appraisal issues, the buyer will make up the difference. Yes that happens for our clients. Getting an offer is exciting however it takes an experienced team to overcome the challenges of a real estate transaction. It takes experience to deal with title, financing and inspection issues. Call Treu Group and let us take the stress off of you!